LSSND has not offered a response. Fargo, a city of 115,000, is the county seat of Cass County, which has a population of approximately 175,000. The county is governed by a five member commission. The city is governed by a mayor and city council. The Fargo Cass Public Health Department (FCPH) serves both the city and the county. North Dakota is one of fourteen states that have withdrawn from the federal refugee resettlement program where the resettlement of refugees is managed by contractors, such as LSSND in North Dakota, hired by the federal government under the statutorily questionable Wilson Fish alternative program. 1,710 refugees were resettled in Cass County, North Dakota, by LSSND between 2011 and 2015, more than 69 percent of the 2,459 refugees the agency resettled in the state of North Dakota and nearby Clay County, Minnesota, (which received a total of 77 refugees) during that five year period, according to LSSND. Fifty-nine percent of the refugees resettled in North Dakota and neighboring Clay County, Minnesota, by LSSND during these five years, or 1,452 out of 2,454, came from Bhutan, a country that has high rates of active TB and latent TB infection (LTBI). Thirteen percent of the refugees resettled in North Dakota and neighboring Clay County, Minnesota, by LSSND during these five years, or 316 out of 2,454, came from Somalia, another country that has high rates of active TB and LTBI. The incidence of TB in Bhutan ranged from 164 to 192 to per 100,000 between 2011 and 2015. The incidence of TB in Somalia ranged from 284 to 292 per 100,000 over those five years. During that same period of time, the incidence of TB in America was never greater than 4 per 100,000. “Approximately 8% of Bhutanese refugees arrive in the United States with a class B1 TB designation (TB fully treated using Directly Observed Therapy, or abnormal chest x-ray [CXR] with negative sputum smears and cultures, or extrapulmonary TB),” the Centers for Disease Control (CDC) reported in 2014. “During post-arrival screening exams in Texas, however, all [Bhutanese] refugees (adults and children) are administered either a TST or interferon-gamma release assay (IGRA) test. Of these refugees, 22% of 569 children aged 2–14 years had a positive TST or IGRA [the tests for LTBI] while 48% of 1,905 adults aged 15 years and over had a positive TST or IGRA,” the CDC report concluded. The 48 percent positive rate for LTBI among adult Bhutanese refugees recently resettled in Texas is extraordinarily high. The rate of LTBI around the world is 33 percent, while the rate within the general population of the United States is only 4 percent. Reported LTBI rates among refugees recently resettled in the U.S. range from a high of 35 percent in Vermont, to 27 percent in Tennessee, 26 percent in Indiana, 22 percent in Minnesota, 15 percent in Texas, to 12 percent in California. Though the FCPH did not release LTBI data for recently arrived refugees, nearby Grand Forks County, North Dakota, Department of Health confirmed to Breitbart News that 29 percent of the 561 recently-arrived refugees there tested positive for LTBI between 2011 and 2015. As Breitbart News has reported previously, the number of active TB cases in the United States increased by 1.7 percent in 2015 to 9,563. It was the first increase after 23 continuous years of decline. The resurgence of TB is largely due to the increase in the number of foreign-born residents in the United States from countries with high rates of active TB and LTBI. In 1986, when there were only 11 million foreign-born residents of the United States, 22 percent of the 22,000 active cases of TB were foreign-born. In 2015, the number of foreign-born residents of the United States had increased by 31 million to 42 million. 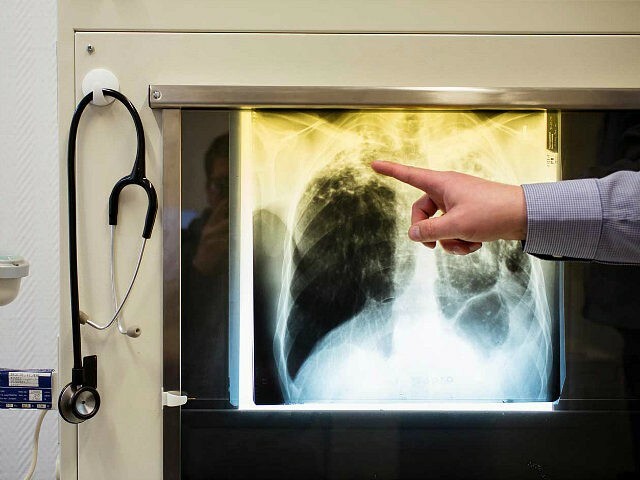 That year, 66 percent of the 9,563 active cases of TB in the country were foreign born. The four cases of active TB among refugees who have resided in the United States for less than five years confirmed in North Dakota adds to the growing number of active cases of TB among recently resettled refugees in several other states: twenty-one in Louisiana, eleven in Florida, ten in Colorado, four in Indiana, and nine in only one county in Kentucky. Our findings suggest that newly arrived refugees with LTBI have a considerable burden of clinical risk factors that increase their risk for reactivation of TB, which may contribute to the increased proportion of active TB among foreign-born populations in the United States if not prioritized for LTBI treatment. Efforts to ensure adequate LTBI treatment among high-risk refugees such as those documented in this study should be a public health priority. The UC San Diego study, which “analyzed data from LTBI [latent tuberculosis infection] screening results of 4,280 refugees resettled in San Diego County between January 2010 and October 2012,” is one of many that conclude high rates of LTBI pose a health risk to the general population. “The prevalence of LTBI was highest among refugees from sub-Saharan Africa (43 percent) and was associated with current smoking and having a clinical comorbidity that increases the risk for active tuberculosis,” the study found. Sub-Saharan African refugees in San Diego come primarily from Somalia, as do 13 percent of refugees resettled in North Dakota. The study explained why refugees from sub-Saharan Africa present such a challenge to public health. “Although refugees from sub-Saharan Africa had the highest prevalence of infection, they were significantly less likely to initiate treatment than refugees from the Middle East. Refugees with postsecondary education were significantly more likely to initiate LTBI treatment,” it concluded. When local Fargo, North Dakota, NBC TV affiliate KVLY reported several facts about active TB and LTBI in a May 16 broadcast, local pro-immigrant activists, LSSND, local left-wing media outlets, and several local elected and appointed officials launched an intensive propaganda blitz attacking the station’s factual reporting. A small protest that was advertised as a “peaceful demonstration” by a local Somali activist group turned into a confrontation outside the Valley News Live studios on Sunday. Protestors confronted a Valley News Live photographer as she attempted to shoot video of the event. Fargo Police removed the protestors from the KVLY property. Moorhead Mayor Del Rae Williams and Fargo’s Deputy Mayor Mike Williams also showed up for the event. Both support refugee resettlement in the area. The group demonstrated because they said they were upset over reporter Bradford Arick’s story on the risk of latent tuberculosis in local refugee communities. Our story presented data and facts from the CDC, State of Minnesota and State of North Dakota on the numbers of latent TB cases in the refugee population. The State of Minnesota says 22% of refugees in that state carry latent TB while only active TB cases bars someone from entering the country. The Fargo Forum newspaper criticized Valley News Live’s reporting as blatantly false. Forum Communications owns our competitors WDAY and WDAZ. The newspaper also interviewed Cass County Health Department’s Dr. John Baird. Baird told the forum that TB is quote “not a major problem” in the area but later admitted that Cass County Health is treating active TB cases in the community. Throughout this time period, and until Sunday’s Breitbart News report, LSSND and the FCPH refused to release some critical public health data about recently-resettled refugees in North Dakota the public has a right to know. The North Dakota Department of Health was responsive but did not have all the information available. FCPH’s Baird released the active TB data only after Breitbart News appealed directly to Fargo Mayor Tim Mahoney to instruct Baird to do so, in the tradition of North Dakota honest government and transparency. What you requested of me required examining individual personal medical records. Due to the small number of cases I risk violating the privacy of individuals. In spite of my reservations about continuing to respond to your ongoing requests I did use my time and other staff time to search through medical records and assemble the following information that we normally do not track. The active tuberculosis cases with which we were involved included pulmonary and extra-pulmonary cases. Extra-pulmonary tuberculosis is not contagious to others. One leading North Dakota state legislator, Rep. Al Carlson, the House Majority Leader, has suggested North Dakota should join Tennessee’s Tenth Amendment lawsuit against the federal government for its operation of the refugee resettlement program within the state’s boundaries. Like North Dakota, Tennessee is one of the fourteen states that have withdrawn from the federal refugee resettlement program.